Briefly boil the edamame and the corn, just until tender. Drain very well and cool completely. In a large bowl, combine the edamame, corn, quinoa, green onion, red pepper and cilantro. Recipe found on 86 lemons. Picture from original recipe posting. Find it here. Preheat oven to 500. Score an X in the bottom of each tomato and place them on a foil-lined rimmed baking sheet. Roast tomatoes for 25 minutes, until softened and slightly charred all over. Cut the stems off the guajillo chiles and slice them lengthwise. Shake out the seeds. Lightly toast them in a small cast iron until fragrant, about 2 minutes. Transfer to a bowl of cold water and let sit for 30 minutes, or until soft and pliable. Back the skillet, toast the onions and garlic until you see good charred marks on all sides, and the onions have softened, about 10 minutes. To a blender, add the tomatoes (with the skins peeled), onions, garlic, chiles (drained from water), sriracha sauce, cloves and allspice. Puree for a good two minutes, until very smooth. Add a little water if needed. Heat the vegetable oil in a large dutch oven over medium high. Add the puree (it will probably splatter) to the pan and and cook until slightly thickened, about 5 minutes. Add a cup of water, vinegar, sugar and a Tbs. of salt. Partially cover and simmer on a medium heat for 30 minutes, adding a little more water if needed, to keep it at the same consistency. In the meantime, flip your oven to broil. Place the poblano peppers on a baking sheet and broil until blackened and charred all over, 5 to 10 minutes. Remove from oven and immediately transfer to a small plastic bag, and seal it. Let sit for 15 minutes, allowing the skin to loosen. Once cool enough, peel the skin away from the peppers and slice into small strips. 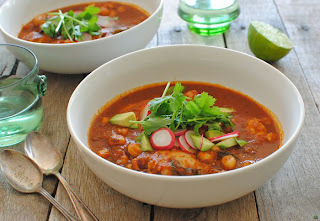 After 30 minutes of simmering, add the chicken, cilantro, mint, Mexican oregano, hominy, chicken stock and another Tbs. salt. Stir to combine, and simmer on medium for another 30 minutes, until the chicken is cooked through. Ladle pozole into bowls and garnish with sliced radishes, dice avocado, fresh sprigs cilantro and a good spritz of lime juice.